Do you need some flooring ripped out? Give Sunshine Interiors a call! We specialize in removing wood flooring, glue down carpet, VCT, and other types of flooring. 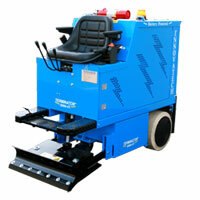 Our state of the art machine (pictured below)and experienced crew can have that old flooring up in record time! Give us a call for a free estimate at 863-644-5500.